2016 is drawing to a close, so now is as good a time as any to review some of the biggest and most notable trends in bathroom design this year. If you’re at all curious about what people these days are looking for in shower enclosures, vanities, or other bathroom accessories, check out our list below. One of the most prominent current design trends in bathrooms is what some people are calling the “Mediterranean look.” This style puts a heavy emphasis on tile flooring, hand-painted terra-cotta, and metallic accents to recreate the look of classic Greek, Spanish, and Portuguese design. If you prefer old-world sensibilities over new-world homeliness, then this is your time to shine. This one can be seen as an extension of the entry above, but is distinct enough to deserve a place on the list of its own. Rather than sticking with the typical symmetrical tile designs, bathrooms in 2016 were often a showcase for more creative and interesting tile layouts. Using tile to create visually engaging patterns, bathroom designers are finding new and exciting ways to reinvigorate this traditional flooring material. With the recent explosion of tech-heavy and “smart” technology in the last few years, it was only a matter of time before this trend reached the bathroom. New twists on old bathroom mainstays include tubs with built-in audio systems, counters and vanities with refrigerators to store makeup and hair care products, and automatic mood lighting to make bath time even more relaxing. 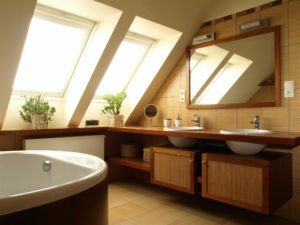 In addition to finding new ways to trick out their bathrooms, homeowners are also still interested in making their toilets, sinks, and showers more eco-friendly. Thanks to the introduction of the WaterSense label (the equivalent of the EnergyStar label but for saving water instead of energy), finding water-saving appliances for the bathroom is now easier than ever, helping drive consumer demand for manufacturers to improve the performance of their products. In addition to reducing one’s environmental footprint, these appliances can also substantially lower the monthly water bill, making them a great investment on two different fronts and ensuring the trend of greener bathrooms isn’t going away anytime soon. 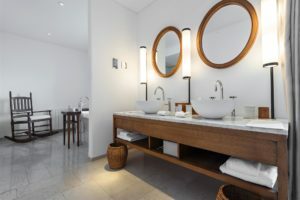 One of the most common issues that bathroom design has to address is how to make what’s usually a relatively small space feel open and uncrowded. Another of the big issues it needs to address is simultaneously making sure there’s enough storage space. Open shelving helps address both of these issues by providing plenty of storage space for towels and toiletries, while also creating the illusion of more space. Time to replace the doored cabinets with something more inviting. American Bath Enterprises, Inc. specializes in shower and bath enclosures of all kinds, including ADA-compliant shower and bath stalls for the disabled. For more information about our products or for helpful installation instructions, contact us today at 888-228-4925.